Ready to play your club, bar, stadium, restaurant, party, BBQ, country, event of any kind. 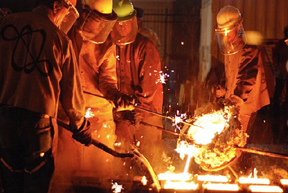 Reasonable & flexible rates. Solo, duo, trio, quadro, etc. 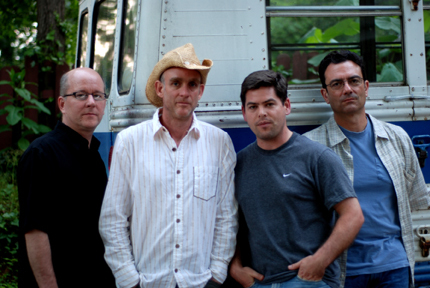 With Stewart Brown, Ryan Johnson, Marv Peck, and Sid Barrett. 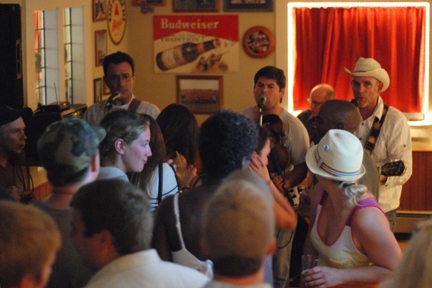 BHR will appear on the stage at Blind Willie's for the 100th time on Saturday August 18, 2012. 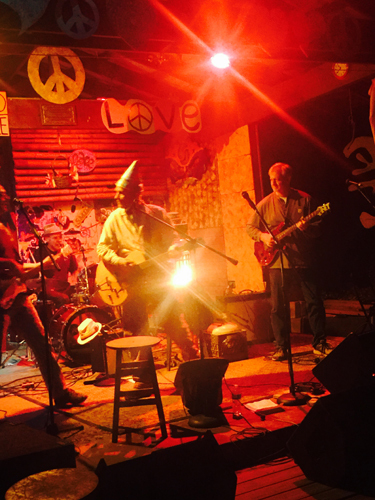 Featuring founding members Clark Ashton & Pete Frisina with Peter Lussier on fiddle, Ryan Johnson on guitar, and Mike Gamble on drums. Special thanks to Eric King for bringing us on back in August of 2003. Also thanks to Gordon, Spike, Zac, and all the waitresses, bar backs, & door men who have helped keep us working & watered. 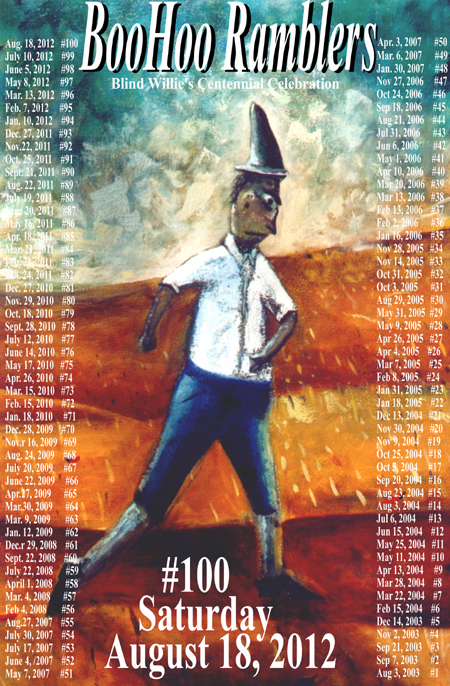 The BooHoo Ramblers have turned 10 years old. 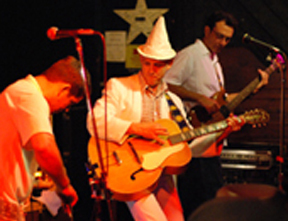 Back in the Summer of 2002, Clark, Pete, and Jr. Mitchell played their 1st gig as a band. Now Jr. is back in Ireland, while Clark and Pete continue to ramble on with variations of BHR featuring Peter Lussier on fiddle, Ryan Johnson on guitar, Jim Landt on dobro, Doug Marlatt and Mike Gamble on drums. 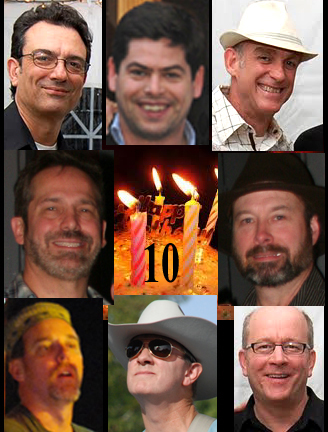 Thanks to all who have made this great fun for 10 years. 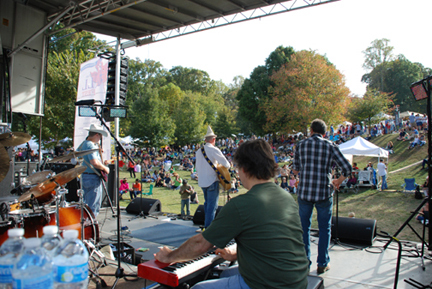 With a full lineup featuring Ryan Johnson on electric guitar, Dave Ellington on organ, Peter Lussier on fiddle, and Mike Gamble on drums, BHR did their part to shake the leaves off the trees at the Candler Park Fall Festival. Beautiful weather and a great crowd made for a perfect day of music, art, and fun. We thought the floor would cave in. The house was literally rockin' at Cuzzie's Quarterdeck Bar. Good times at Gritty McDuff's in the old town. After many fine gigs featuring Ryan Johnson and Jim Landt in the solo slot, Jr. Mitchell returns for a Maine event. With a new(1990) Dodge RAM 15 passenger van we're ready to roll to lobster country. The dream lives on! A fine fine evening to wrap up the year. Cold as 26 degrees but a good turnout to witness the 3rd installment of Jr.'s Xmas reunion. 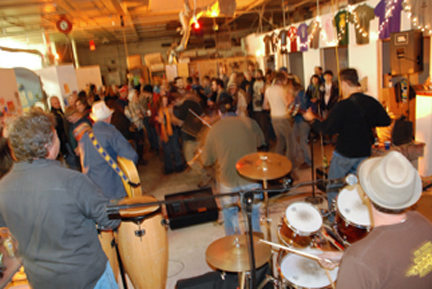 A full stage with Ryan Johnson on electric guitar, Mundi on keys, Doug Marlatt on drums, & Joe Booms on congas. We look forward to many good new things in 2010. Bigger and better than before. A beautiful wedding at Bective Abbey, a great turnout at the pubs, and we saw the sun rise more often than not. Great drumming by "Joe the Drummer" of Drogheda who joined us for 3 gigs. A chance acquaintence at a session in Cairbre's got us a banjo player and tour guide for Malin Head. Thanks Donal! Breege in Ramelton runs a great music venue at The Bridge Bar. Thanks Breege! And the girls of Donaghadee can really dance and sing too. And Ollie, the best international tour manager ever, again sheltered, fed, and watered us relentlessly. What more can you say? We cry and move on. Its what we do. 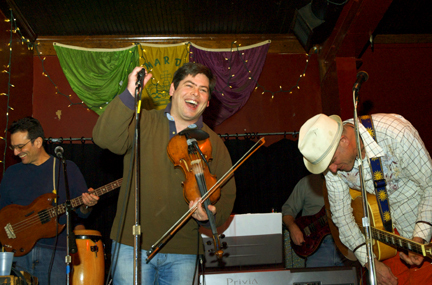 After 7+ years, 400+ gigs, and 2 CDs, founding member/ fiddle player Patrick "Jr." Mitchell, has big and exciting plans. He and Leslie Cunningham will be married in Duleek, Ireland July 31. Best Wishes Jr. & Leslie!!! He will then begin medical school in Cork, Ireland, so will not be returning to Atlanta. We will miss him & know you will too. 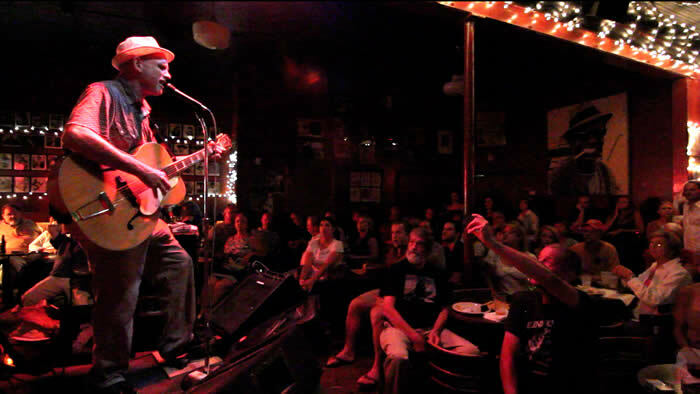 Thanks to all who came out Monday July 20 to Blind Willie's for "Jr's Last Stand" in Atlanta. 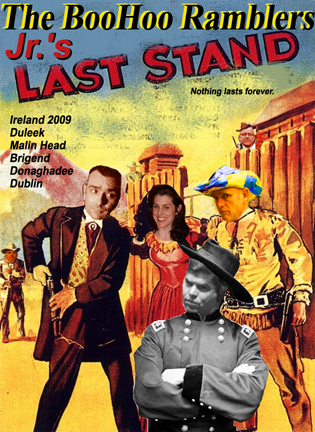 The good news: That kicks off our 2009 Ireland "Jr's Last Stand Tour "!!! Of course we hope to have a reunion show at some point, but who knows when that will be. Stay tuned. 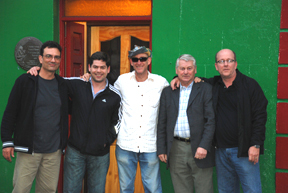 The BHR Ireland Tour 2008 was an overwhelming all-around success. Great gigs, good fun, overflowing glasses of Guinness, stunning scenery, new friends... in essence, everything we had hoped for and more. All we needed was more time. And getting a free 1st class upgrade for the flight home was sweeeeet. We now look forward to an extended tour in the near future. Special thanks to International Tour manager Oliver Mitchell for keeping us sheltered, focused, fed, watered, and thoroughly entertained. See the photos page for a sample of this memorable adventure. After drenching the drought stricken city for 2 days, the storm gave way to sunshine at the Atlanta Dogwood Festival on Sunday at Lenox Square. Good crowd, good sound, good fog machine...How fun was that!?!?! 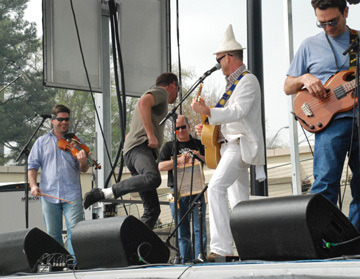 Below, drummer Mike Gamble shows off his black shoes, white socks, & dance moves between songs. Photo by Allison Lange. Click photo to see more. As promised, singing, laughing, drinking, & playing carried the day. It came and went and the reaper never showed. Dancing and shaking ensued in defiance. We did what we could. What else could we do? I'm just happy to be here. Two new videos, "After the Storm" & "Main Squeeze", were produced and can be seen on the VIDEOS page. Special thanks to Dane Primerano for excellent camera work. 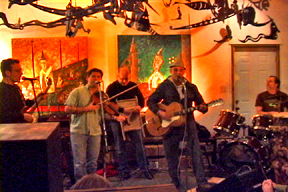 Thanks to all who attended the double header at The Commuter Gallery Saturday March 1. That was fun! And special thanks to Mary Swan & Patrick from Clark(50) & Dr. Leslie(PhD) for puttin' it on! To see the resulting video of "Uncle Jess", click on the image below. 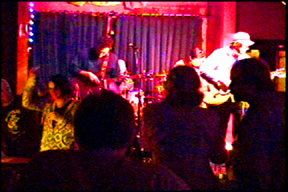 A great time was had by all in the Midnite Room for the the release of "Other Side of Heaven", the second studio recording by The BooHoo Ramblers. Thanks to all in attendance and especially to all who worked to make this thing happen. Special thanks to Steve Priest for the live video of "Phineas Gage", & Allison Lange for photos. Click on image below to see video. The new studio CD has been completed! It's been a long slow process but it's finally done. We are now anxiously awaiting delivery of the packaged product. The disc contains 10 new songs and features some considerable stylistic departures from the debut CD while remaining connected to it's own roots. With a host of guest musicians, this disc rocks, stomps, reflects, and moves on. 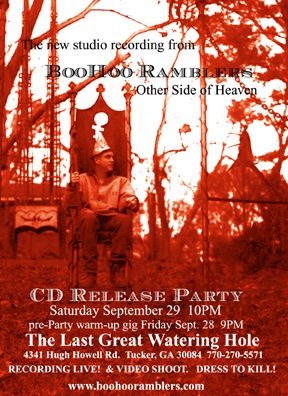 A CD Release Party has bet set for Saturday September 29 at The Last Great Watering Hole in The Midnite Room starting at 10PM. We will be recording the show LIVE! and shooting video as well. So put on your clubin' clothes & yer best hat & shoes. Come on out to help us celebrate, and be a part of our next CD/video! 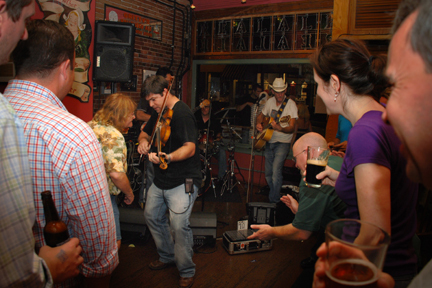 Check out The BooHoo Ramblers in Avondale Estates at James Joyce Irish Pub this summer & fall as we will be appearing every other Saturday for outdoor dinner time shows with drinking, dancing, and good times continuing into the evening. The spacious patio is perfect for all ages. 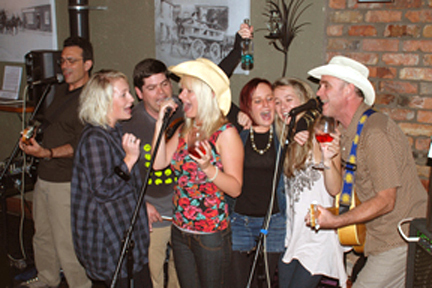 With great food, cold beer, and The BooHoo Ramblers you can't go wrong! Music starts at 7:00PM . See our calendar for exact dates. 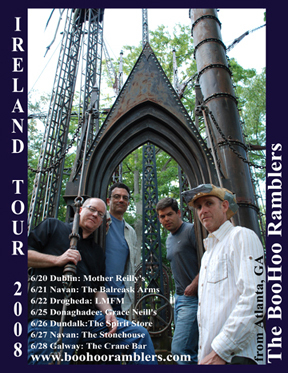 The BooHoo Ramblers are celebrating their 5th year as a band this June 2007. 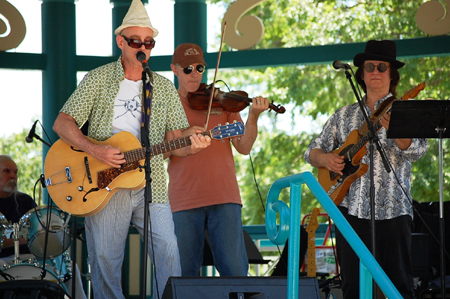 The BooHoo Ramblers are a three-piece roots-oriented band playing original and cover tunes that blend traditional, country, folk, and bluegrass styles with a nod to the Brits who also influence our music. Familiar, unique, heartbreaking, hilarious, & always entertaining. From “The Green Green Grass of Home” to “Aqualung”. 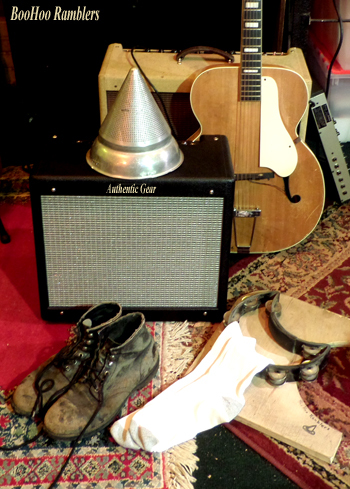 A rollicking stomp through the genres. The core of The BooHoo Ramblers is the 3 piece group whose natural chemistry allows for unpredictable tangents and spontaneous arrangements. Rarely using a set list they hammer through unlikely medleys experimenting with variations of both original and cover material. Lead vocalist Clark Ashton employs a hard strumming right hand in conjunction with a tambourine stomping left foot to set the pace for Pete Frisina's integral driving bass lines while Patrick Mitchell solos on fiddle and both engage vocal harmonies. 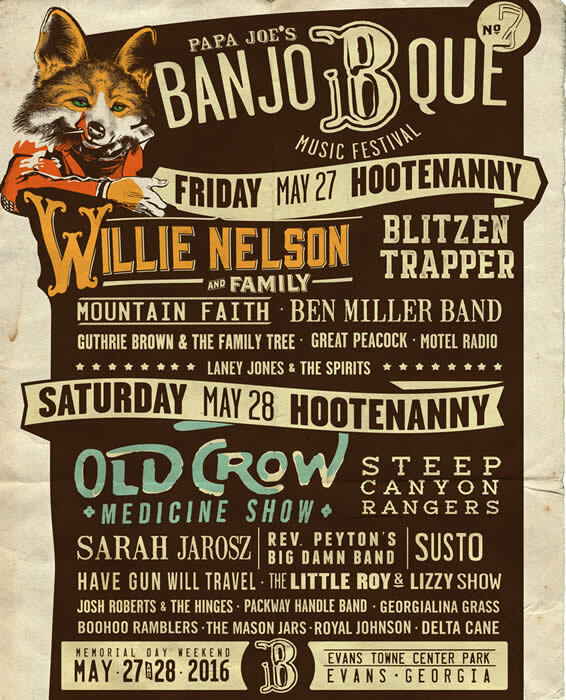 Often the band is joined on stage by dobro, mandolin, drums, or guest vocalists that offer variety, depth and texture to the core groups tight sets. Upbeat and highly stylized versions characterize the interpretation of cover material of familiar tunes by artists ranging from The Carter Family to Jethro Tull. Original songs are written by Clark who serves as the leader & spirit guide for the group.